Way back in 1995, when Newt Gingrich was at the peak of his power and making a whole lot of noise in Congress, I was a (very green) newspaper reporter in Virginia. I wrote a (very silly) weekly column with my colleague Ken Baker, and it only made sense that we go to Washington D.C. to mess with Gingrich. We went to the nation's capital to find Newt Gingrich. He was out of town. We left a list of questions. He never answered them. But we don't mind. Really. Empowered with a one-day-only press pass, we roamed the hallowed halls of the Capitol and acted like journalistic goofballs. We brushed shoulders with presidential candidates and D.C. reporters who take themselves way too seriously. Our mission began with a search for Newt: the round-faced Republican Speaker of the House, the distinguished gentleman from Georgia, the great American Contractor and perhaps one of the most powerful men on planet Earth. With notebooks in hand, we emerged from the underground Metro station and headed toward the mythical white dome of democracy. Outside, hundreds of high school students and tourists lined up before the marble steps of the Capitol. A tourist-handler lady told us to get in line. "We're with the press," Ken explained. She pointed us to a side door reserved for special folks like us. We climbed three flights of spiral stairs, told three sets of armed guards that we didn't yet have our press credentials and passed through two metal detectors before finally reaching the Senate press office. The guys handing out press badges asked for proof that we really were reporters. We didn't blame them. "What are you covering today," one of them asked. We could have said, "We're Newt hunting." But that would have sounded silly. Unprofessional. "Um, we're hoping to cover the Foster nomination," Ken said. The big news of that Friday had something to do with a Senate committee hearing on whether Henry Foster should be surgeon general. A real sticky subject, shaded with moral issues like where life begins, the size of cigarette warning labels and stuff like that. So, naturally, we avoided it. We headed toward the House side of the Capitol. That's where Newt hangs out. Confused tourists clogged the corridors, staring at the ceilings and statues and paintings of guys in powdered wigs. Glenn approached two loitering students and showed them a photo of Newt he had ripped out of that day's Washington Post. "Have you seen this guy?" he asked. "That's Newt ... somebody, right?" one of the teen-age girls guessed. A few yards away we spotted the office of Bob Dole, the Senate majority leader and Republican front-runner in the next presidential election. We had heard he doesn't get along real well with Newt. "I don't want to be here," Ken explained to a secretary who sat surrounded by pictures of Bob. "We're looking for Speaker Gingrich's office. Do you know where it is?" She directed Ken "past the Rotunda" and to the right. We knew we had found our destination when we saw a Tyrannosaurus Rex skull encased in glass. 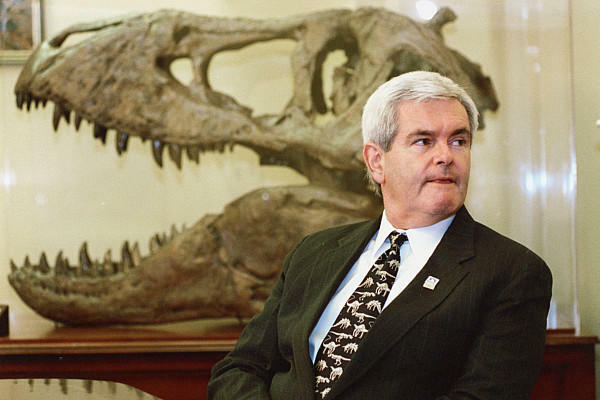 Newt keeps a full-scale model dinosaur head just outside his office. A guard stopped us before we got too close. We said we were looking for the Newt. He pointed us down the hall to the big man's press office. What we saw in the room was this: one guy watching C-SPAN on his computer and no fewer than 10 larger-than-life photographs of Newt Gingrich's head. The biggest one would have fit nicely on the body of a towering, flesh-eating reptile. The guy at the computer, Robert George, explained that he writes all of Newt's newspaper opinion pieces and that nobody important was in the office that day. Newt, he told us, had flown to New York to meet with "the editorial board of either Time magazine or The New York Times, I forget." Luckily, we had already written our 10 questions down. We handed the sealed envelope to a terse Newt press aide named John Cox. And then we took some photos with the enormous Newt head. Just when we thought we were annoying the busy staffer, John asked us if we'd like to see the balcony outside the speaker's office. Newt does a lot of work out there, he said. "We got new cushions," John said of the lawn furniture set near Newt's office window. Glenn asked if we could lounge in the Gingrichian seats. "You don't want to sit in Newt's chairs. They still have plastic on them," John replied. Newt staffers also spend time on the balcony, he said. John then told us the closest thing to a scoop we got all day. "The day before St. Patrick's Day, the Prime Minister of Ireland sent a keg of Guinness for the president and Newt and the ambassadors - and they barely tapped it," he said. "Needless to say, we, uh, finished it off." Do you use hair spray? If so, what brand? Were you psyched when you heard Connie Chung was fired (considering that she slimeballed your mom)? Why do you kiss up to people who call FBI and ATF agents jackbooted thugs? What does jackbooted mean? And is it a good thing? Why do the rich seem to get richer and the poor, poorer? Which world religion is the one true faith? Does Green Day rock? Or are they just a bunch of posers? If you could be president of any world nation - except the United States - which one would it be? "Hi, Ken. This is Robert George from Newt Gingrich's office. I think we met on Friday when you and Glenn visited. I called you to let you know that unfortunately the Speaker won't be able to respond to your questionnaire. We appreciate your dropping it by. He's going to be out of town most of the next couple of weeks. Time constraints just don't quite fit it in."